Leading US pizza chain Flippin’ is planning to pump more than $100 million into the UAE market as part of its expansion plans for the emirate, said a senior official. We plan to bring unique brands like Flippin’ Pizza to strong growth markets with appropriate demographics that suit the brands they have selected, remarked Herminio Llevat, the CEO and founder of Flippin’ Pizza International. 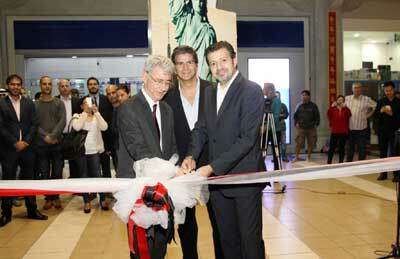 He was speaking at the launch of its first outlet in the UAE at the China Court of the Ibn Battuta Mall. The inaugural branch was opened in partnership with Magnolia Restaurant Management (MRM), a leading food and beverage operator in the GCC and Middle East region. Flippin’ Pizza’s first branch in the region captures the signature feel and atmosphere that the pizza chain is famous for - offering a unique New York style and theme complete with an open kitchen for diners to see the actual preparation and cooking of the pizzas and pasta dishes made by the restaurant’s American master pie makers, stated Mustafa. "To give diners a unique New York ambiance and feel, a large television screen has been placed strategically in the heart of the restaurant and will preview videos of the iconic New York Times Square. To enhance the “New York” experience, two American Pizza master chefs will oversee the pizza operations and interact with Flippin’s customers," he added. Since opening its first branch in 2007, Flippin’ Pizza has become well known for its hand-tossed New York influenced pies and homemade pastas with its eponymous Flippin’ sauces. All dishes offered are prepared without added oil or sugar and has no high-fructose corn syrup. “Flippin’ Pizza presents you with that genuine ‘I’m from New York’ taste and feel—a mouth watering pizza that is authentically hand tossed to perfection,” said Salam Abou Karroum, the head of Marketing, MRM. "As such, Flippin’ Pizza is part of our plan to invest $100 million in new dining concepts and facilities that offer ‘everyday food’ combined with excellent customer service. In fact, we are looking forward to opening two more Flippin Pizza outlets soon, in SZR & Jumeirah,” he added. Nael Mustafa said the Flippin’ Pizza brand has surely come a long way - from its beginnings in New York to its newest outlet here in the rapidly developing emirate of Dubai.